A song to play while reading about the Angels: “Michael” (as in Trout) by Franz Ferdinand. In 1995, Hideo Nomo debuted with the Dodgers and my pee wee baseball practices were never the same again. From the first time we saw that tornado windup – the long stretch, the almost-180 degree turn, the low back-knee drop – all we wanted to do was pitch like Nomo. Playing catch before practice was a long line of kids just trying to stay upright, stretching, turning, and launching baseballs in every direction. I grew up in the South Bay area of Los Angeles, in an area with lots of Japanese American families. Many of the kids on my tee ball and pee wee teams were yonsei, or “fourth generation” Japanese American like me, meaning our great-grandparents came to the States around the turn of the century. None of us spoke Japanese. Few of us had ever been to, or even considered going to Japan. But in Nomo we saw a guy who looked kind of like us, had a name that we recognized (“hey, I have an uncle Hideo!”), and happened to be one of the best pitchers in baseball. To be yonsei is to understand that there’s camping, and then there’s camp. We’d only hear bits and pieces about it growing up, but looking back, its legacy impacted us in ways we never really considered. As kids, we didn’t learn to speak Japanese, we learned to play the Great American Pastime. Our parents didn’t meet up with their friends at church, they met up at the local diamond to watch our 9am baseball games. Baseball was part of our identity. We were steeped in the game, yet things were different after Nomo. Because he wasn’t just there, he was dominating the best players in the game. We could be that! Since 1995, plenty more Japanese players have come and gone, we’ve witnessed the greatness of Ichiro, and we’ve seen more Asian American players. We even see yonsei playing (what up, Kurt Suzuki) and on deck (get em, Keston Hiura). And, of course, the first woman to ever play in the West Coast League. Today, kids around here are a little more used to seeing ballplayers like them. Still, Shohei Ohtani feels like a Nomo moment all over again – he’s a leap forward for the game and a new definition of what’s possible. His moonshots and his wicked splitter are already the stuff of legend. That he can do both of those things at the highest level is unreal. He was the clear rookie of the year (sorry Yankee fans), and his success is already changing the way clubs evaluate talent. Nomo challenged our ideas about what a baseball player looks like. Ohtani challenges our ideas of what a baseball player is. At Angel Stadium, it’s a sea of Ohtani jerseys. Even when he isn’t in the lineup, we cheer for him when he pops his head out of the dugout. The buzz and the hype is real and it’s infectious. But Ohtani is his typical calm, all business. For all his achievements, he still has work to do — a tough recovery from Tommy John surgery and improving his .222/.300/.354 slash line against lefties. So he certainly isn’t perfect, but has given us no reason to doubt he’ll keep improving. After all, this is the guy who hit a baseball literally into the roof of the Tokyo Dome. With Ohtani, anything is possible. And that’s something every kid can look up to. What is the Angels’ most recent accomplishment? One playoff appearance since 2009? Zero postseason wins? Challenge accepted. This week, Mike Trout inked a historic 12-year, $430 million contract extension with the Angels. It’s the largest deal for any athlete to date, setting records for total contract and average annual value, and keeps him in Anaheim through his age-38 season. Yet it’s arguably still a great deal for the Angels. Trout’s career 64.9 fWAR is the most by any player through his age-26 season and he’s already a no-doubt Hall of Famer. If he’d tested the open market in 2020, a $500 million or even $600 million deal wouldn’t be out of the question. But that’s all moot now. Simply put, this extension is the franchise’s biggest accomplishment since Game 7 of the 2002 World Series. 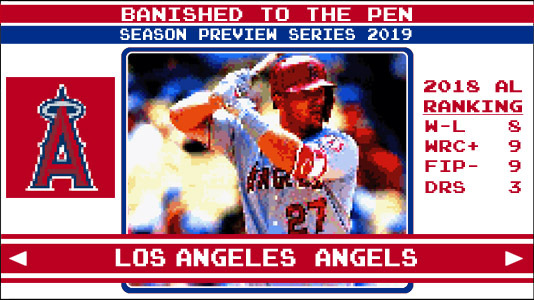 What does success look like for the Angels in 2019? Success this season means winning a playoff series for the first time since 2009 — with the mighty Astros atop the AL West, the Angels are realistically playing for a wild card spot. Organizationally, success means grooming a strong core to finally take advantage of Mike Trout’s prime years. Perhaps no Angel exemplifies the spin-rate revolution more than 28-year-old right-hander Luke Bard. From 2012-16, Bard relied on a sinker to induce weak contact, with a strikeout rate around 8 K/9. In 2017, that number jumped to almost 14 K/9. So what changed? Bard did some research and realized that his spin rate ranked among the league’s best. In fact, from 2017-18, his 4-seam spin rate of 2770 RPM ranked first among MLB pitchers. This spring, he sports a 1.59 ERA, 0.35 WHIP, and a 9/0 K/BB rate, relying on belt-high 4-seam heaters. Bard will have every chance to make the opening day squad and could be a critical arm, considering the team’s results so far this spring. Tuesday, July 19th, Angels v. Astros, Ohtani Bobblehead Night. Sure, it’s a Tuesday night during the dog days, but it’s a classic AL West duel between the Halos and Stros. Trout, Ohtani, and Simmons should be in midseason form and you’ll walk away with some Shohei swag. Everybody wins. Except for the Astros. Hopefully.